Whether it is through the deep history and extensive use of Traditional Chinese Medical and Ayurvedic Herbalism or North American Organic Herbalism true health can be improved and restored through herbalism, the worlds oldest medical system. Chinese herbal medicine focuses on correcting imbalances and restoring harmony in the body to achieve health. Rather than treating a particular disease, herbs are used to treat disharmonies existing in the individual. Once the imbalance is corrected, healing can take place. The use of Chinese herbs is very popular in Asian countries and is now becoming more and more commonplace in North America. Many modern day western drugs have been developed from Chinese herbs. The use of Ma Huang (Chinese Ephedra) has been used in treatment of asthma and hay fever, hepatitis has been treated using Wu Wei Zi (Schizandra Fruit) and Gan Cao (Licorice Root) to name a few. Other Chinese herbs such as goji berries, ginseng, gingko, reishi mushrooms, etc have only recently become very popular in the west, These healing herbs and many others have been used by the Chinese for hundreds and thousands of years. Currently, modern research into various traditional herbal medicines is providing confirmation of the herbs traditional uses. In what forms might I take Chinese herbs? Chinese herbs are usually dispensed as tablets, tinctures or powdered granules. Granules should be dissolved in warm or hot water if possible and can then be mixed with honey or juice as desired. How pure are the herbs coming from China? Should I be worried about heavy metals, pesticides, etc? The Chinese formulas prescribed are from trusted North American or Taiwanese companies. Every batch of herbs undergoes rigorous testing to ensure potency and freedom from contaminants such as heavy metals and pesticides. Herbs are also randomly inspected by Canadian Government agencies. Unlike some brands one may buy off the shelf in Chinatown, those carried at Balance Point are pharmaceutical grade and available by prescription only. Can I take herbal medicine with vitamins or western prescriptions? In general, herbal medicine is quite safe, however one should always consult their family doctor when adding any supplements or medicinals to an existing prescription. Are their any negative side effects from Chinese herbal medicine? Although herbal medicine can have a very powerful effect on the body, negative side effects are generally rare and mild. The most common negative side effects would be various gastrointestinal disturbances (ie loose stools) though instances are still rare and generally correct themselves if dosages are altered or medications are discontinued. 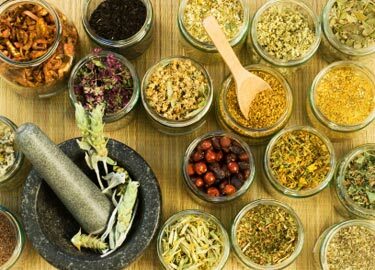 To learn more about herbal medicine click here!